You are currently browsing the tag archive for the ‘Tarot’ tag. A break away from a usual or old way of thinking that could be a negative voice within. Check that. Watch for the inner saboteur, our own trickster when it comes to foundations and / or foundations of passions. We could inadvertently cause our own stumble. Ideas and plans are still young and, yes, even immature, but everything has it’s cycle from birth to death. We are in a state of constant Bardo, culture young thoughts as would a child. Stoke enthusiasm, creativity, and spontaneity. Cultivate those resonating relationships that are highlighting the free spirit, and lift up the melancholy. Let go with that grip! Clinging to the way things are or what you don’t wan to let go of (mentally speaking), and embracing the security of change, the flow, movement and newness. Open up your mind, seek improvement by learning through the experience. There may be concern about how this affects your standing in the eyes of others but one should be cautioned not to be so self deceptive about self importance, or egotistical about the person we wish to be perceived as. Our friends and loved ones see us for who we are, not just the mister or misses popularity that we want them to see. Examine our reflection. Explore our spontaneity, our inner adolescent. See our self in the moving, dancing, singing, spring time world around us. It is young again. Note: Mercury is going to go Retrograde this week, on the 30th. It’s time to be mindful of what we are communicating, transmitting, sending and receiving in our messages psychic, and on the world wide web. *wink* There is a Mars / Aries action adding to an emphasis on the child and action, but that could also lead to foot in mouth disease. Laugh it off. Be light. It’s spring. We just weathered a lovely and powerful deluge in Los Angeles. It was cold enough that at some points it was as if there was snow in the air. I kid you not. Fluffy white flakes fluttering around our third story aerie. Touching the glass and melting. It lasted for all of 10 minutes, mixed in with the rain you wouldn’t even have known it was there unless you were watching closely as it fluttered and then vanished on the window. 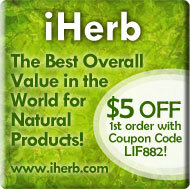 Aligned with the Vernal energies, it’s the natural way, I’m feeling the cleaning bug. Every corner of the home looks like it needs a magickal hand, a witches broom, a wash of lemon and cedar. Shelves look cluttered. Books seem dusty. I like dusty old books. Maybe I’ll leave them alone. Look at the needs to clean and organize on a few levels. Physically clean and organize, if you haven’t already. Get papers, files, and aisles of things in order. As we work on one level we can also cleanse and organize on another. It reminds me of my mother, organizing her thoughts and her day while in the process of cleaning. I do the same thing, it’s a moving meditation. There are some details that I think deserve looking into like taking an idea that you’ve mulled over and finding a means to make it happen. Have a little faith and trust in the process. We’re entering a new phase and doubt, melodrama, acting out doubts or hesitations where we are uncertain about our path or process aren’t going to do anything but make a scene or draw attention to yourself. You may not feel appreciated by those around you, at least in regards to those you might immediately share your “exciting new idea.” Keep it close to the heart. The path is calling. The draw to move into a new direction, or begin a new project is felt, but just not yet. Test the waters, refine your thoughts, mull over a cup of tea and have a little faith. There are some hidden energies at work… or we might say unforseen forces or “the things that are happening just beyond our sphere” that affect us. We can’t see all things. We can’t know all that will happen. 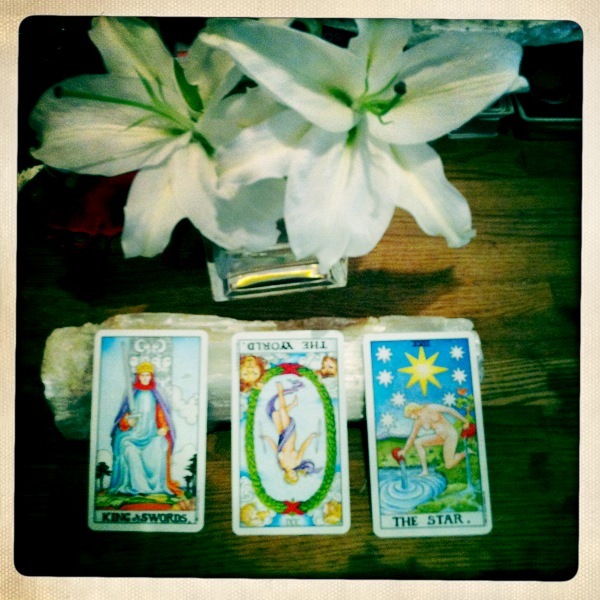 These cards remain hidden but the message: little death, or minor ending and beginning. Watch your finances and specifically how much is going out of the pocket into the hands of others. You could probably benefit with a little Journey Work, and exploration of things unseen to suss out what is draining you of vital energies. Diet. Friend. Situation. Identify where your energies may be leaking, or being leached, away. Use your resources to shore up what you have. Give some thanks for the fact that we have our home, our jobs, life, friends, and health unlike many people in the world today. 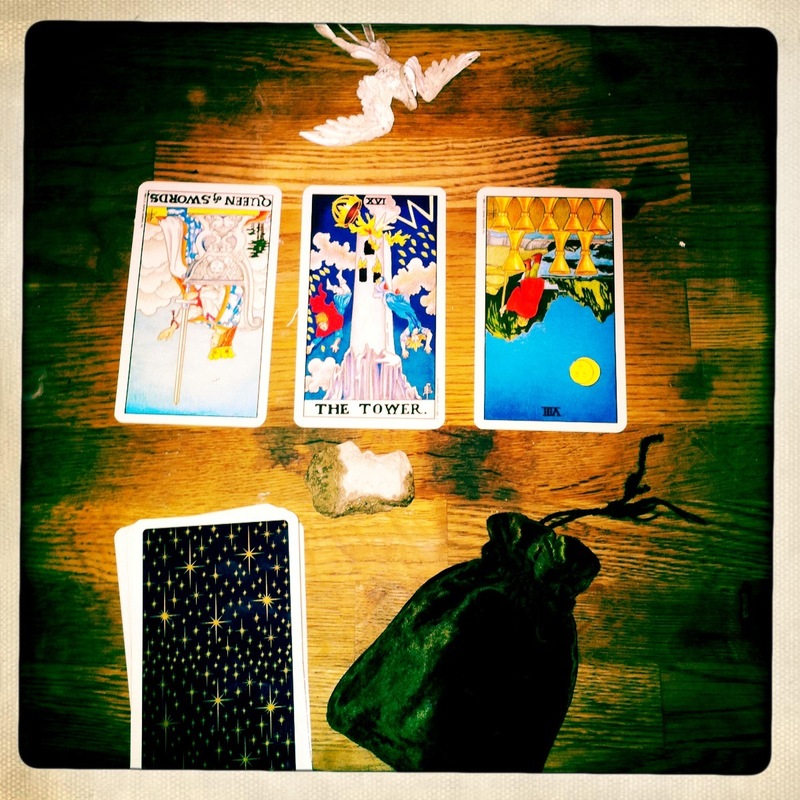 Getting a bigger perspective and wait for the right connections to come into play and until then celebrate your good fortunes with loved ones, family, and friends. Find harmony in all of your elements. I was fortunate to have a little time this weekend, when not at work or cooking, cleaning, and trying to find a piece of the pie to pull my Tarot in advance. You may not know this but if I don’t get to it midweek I’ve pretty much set myself up to jockeying for time on the weekend. It’s no worry but I don’t like to write under a time crunch. This week you will notice there are only three cards. Well there are only two but there is a story there, naturally and up until this morning I wasn’t able to really draw on anything else. The reason there are two strength cards? Well one was lost! 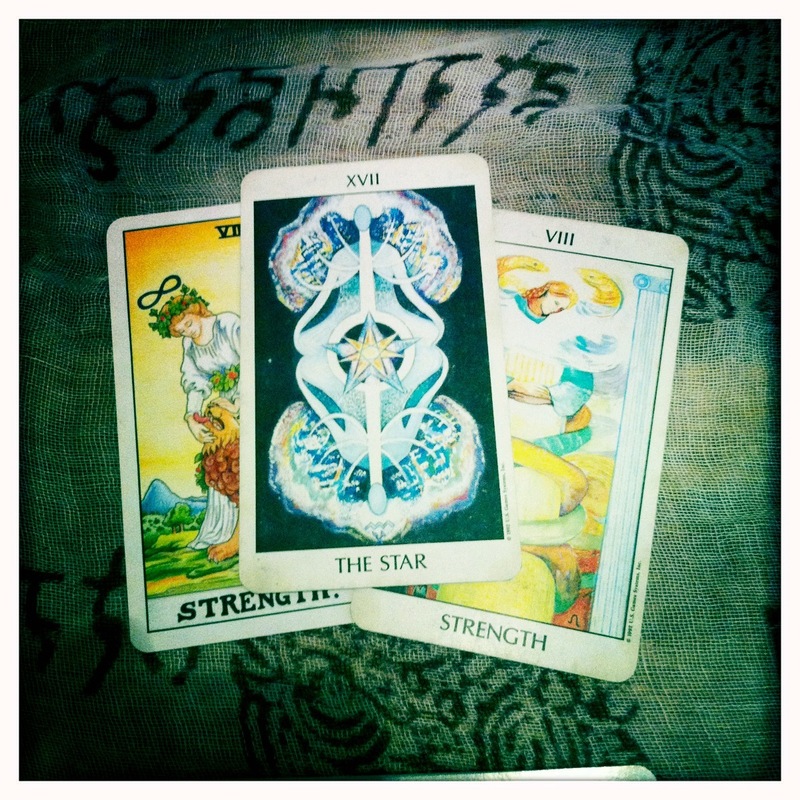 The card on the right has been missing for some time, almost a year and as I put down our significator (The Star) for the reading, the Strength Card came away from the star in my hand. Like a parlor trick the one card became two. Strength! There you are! Stranger, as I picked up my deck to begin the shuffle as I cut the deck, strength was in my hand. Place. 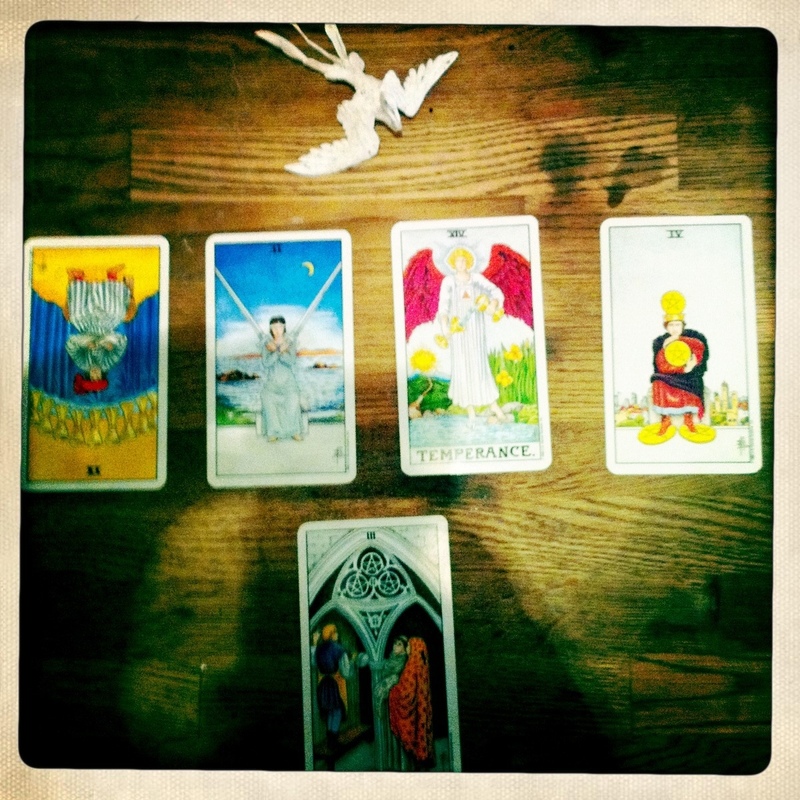 I left the cards in this order and I went into my weekend with an openness to the message here. Seek bliss to find bliss. The internal flame that rises like a serpent in the darkness. ~Pgs. 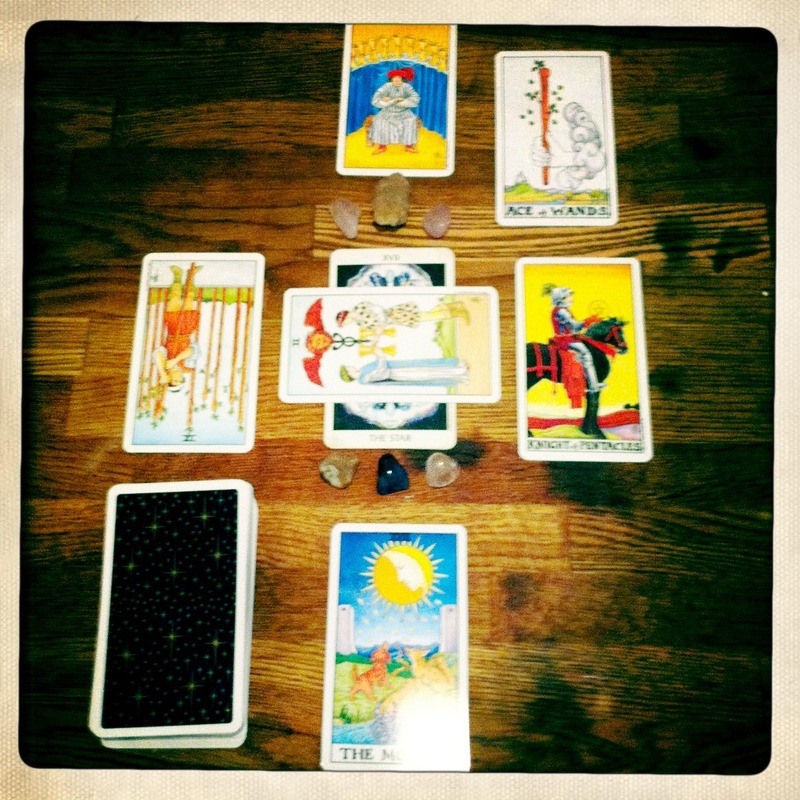 294-295 Strength, Tarot of the Spirit, Pamel Eakins, PH.D. Remember the last line [in the novel Babbitt]? “I have never done the thing that I wanted to in all my life.” That is a man who never followed his bliss. You may have a success in life, but then think of it – what kind of life was it? What good was it – you’ve never done the thing you wanted to do in all your life. I always tell my students, go where your body and soul want to go. When you have the feeling, then stay with it, and don’t let anyone throw you off. What happens when you follow your bliss? On a walk up in the hills behind the Griffith Park Observatory it came to me how much my eye is drawn to plants. It’s no mystery. I look through my digital photo gallery and no matter where I go, I’m watching, inspecting and mentally dissecting the parts and components of plant life. I imagine how deep the roots must travel and spread. I compare the thought to the branches, stalks, leaves and sometimes flowers. As early as I can remember I have been surrounded by plants in my house. I can’t not have them. The more I have the better I feel. It is, however conscious or imagined, my thing. I feel very connected to my green people in the house and out. They give the air I breath, the food that sustains me, you and everything else, and they make my home feel great. It is the feeling that brings the strength because these forces of the natural world are what replenished me on the walk. I derive a great sense of peace and strength from the plant world. I base much of my philosophy on trees, roots, blooms. Nature really does sustain me! In Strength, this week, I would like to see you finding sustenance in your source(s) through activities that bring you to the place where that feeling, the vibration, of your solace is resonating like a song, in every part of your body. Forget the astrology, the details, the minutia and immerse in that at the start of the week. I’m on the recover from a severe cold, a virus that went hack and slash through my system for about a week, a cold that I couldn’t defend against on Friday. I had a few days of downtown, a lot of healing with Reiki, EO’s and some distance help -plus a few healthy chugs on a theraflu bottle when I thought my throat couldn’t take it anymore, and here I am on Monday, wobbling back into action. On Sunday I was not sure I would be able to channel a lick today but it seems that those who send me the weekly message are in tip-top form, and since I’m able to meditate and type, we’ve got a weekly. In considering the Star I came across the following passage in the Tarot of the Spirit which confirmed my guided choice. The Star is also related to Aquarius, the visionary. There is also something authentic about the star, he or she is pouring water into the pool and onto the earth. It may seem strange to un-expecting traveler (The Fool) but when queried the Star explains that the water is for the pool that it may always be full to nourish the travelers who visit it, and the water on the earth is for the life that is seeded and rooted there. It is for the future. I’m looking at the power of the Star shining through in our relationships. The Two of cups does indicate “with others” but I wouldn’t rule out “with our self” if this is right. Re-visioning or healing at a level which brings us into, or back into connections that open our minds and/or allow for a healthy exchange of the life force energy to be a part of the process with an emphasis on love and intimacy. The Nine of Cups in our Northern Quarter tells us that there is success to be had in this attempt, relationships offering rewards that are both satisfying and healthy. Achieving what we want, or your “wish coming true.” Be mindful of what you are wishing for and careful of overindulgence. In our place of power rides the Knight of Pentacles, the Eastern Door and new things but he is a very heavy card, his mind bent to details, minutia, and the letter of the law. This may feel burdensome or overly prudent. My feeling tells me that he (potentially a she) is someone bearing a gift that we should consider (two of cups) against the expansive feeling / energies / that we would like to execute. For some I would question whether this is your idealism meeting practicality, and missing the generosity that is being offered because you can’t be bothered with details. The Moon makes a marked appearance in the realm of our mind. Another emotional card, it is for us to reflect the light of the star through our selves so that our mind is focused on the proper channel of light, not the fears or doubts of the past. That does highlight the importance of the Knight of Pentacles. 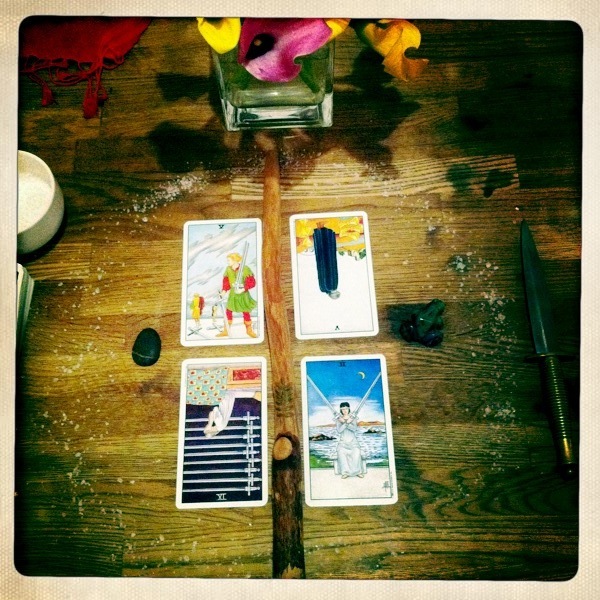 In the Western Door is an inverted Nine of Wands, asking about what sort of experience we are drawing on. The healing is in listening and releasing the past and how you move through your emotional relationships and connections. What is old and outmoded should be clear because you are experiencing it yet again. This isn’t a warning of defeat, simply a note to you saying that you are experiencing a newness and any One (Ace of Wands) bringing the passion of ideas, needs to be looked at as a new creature. A new creation. A new dance that should be experienced, not ticked and weighted against your past and any drama, hurt, or pain you may be holding onto. There is an air of “everything is fine,” but there are elements here that suggest facing some truths or facts of life that you may be trying to dodge or ignore. Pluto’s going to do a little dance with Mercury during the week and this is a message to pay close attention to the details and our surroundings. White phoenix remains in play, highlighting transformations so the details can illuminate changes, passages, and finer notes on our Journey. There is some judgement being applied in two facets as the Temperance card holds the center and ask us to bind together elements, maybe even opposites. Higher and body wisdom, inner tug and the news from a meeting. Our hearts call and our lovers words. With the amount of pentacles in the meeting here, and the oppositions and reinforcing cards, I’m going to go with things related to business, money, contracts, projects, construction / building. Our choices take us through well-worn paths or, when we shift, suddenly open new doors and show opportunities we might not have seen if we had gone the way of before. I’m going to take a little leap here and say it’s an opportunity to combine forces in some way, (Temperance + Three of Pentacles) with an emphasis on projects or constructive gigs. Any sort of stipulations on deadlines, criteria for work, etc that we may have overlooked. 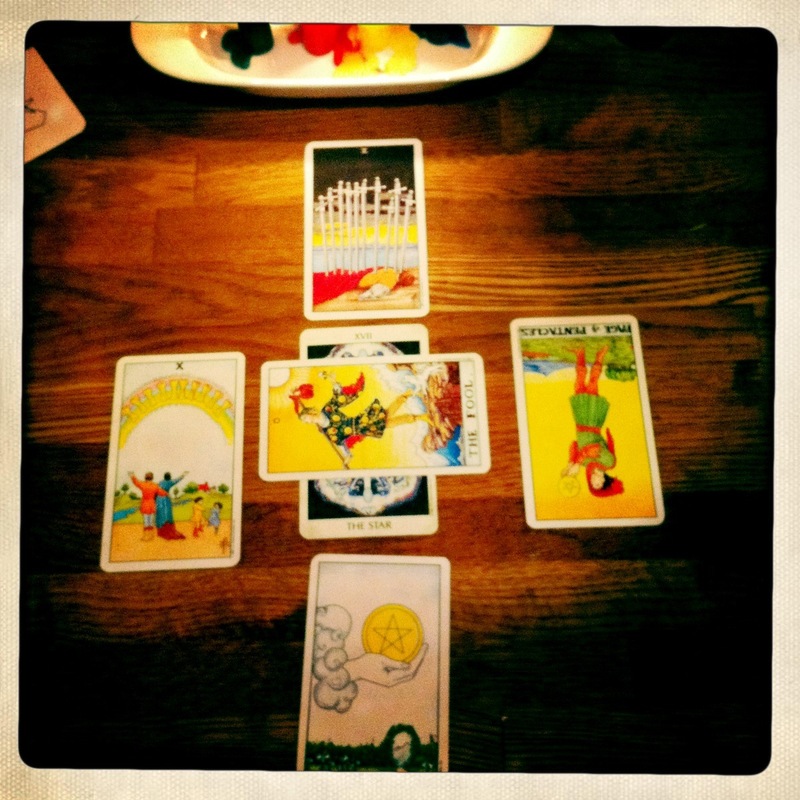 Note the Four of Pentacles and watch for your inner “one-way… MY WAY” reactions. You poor thing, you may have to suffer a few alterations to the design, never worry the present asks for new creativity in our collaborations / contracts and you may find those doors opening in places previously unseen. Watch for smugness, impassivity, indecision, stubbornness; especially any sort of stalemates or stand offs. These are your red flags. Are you being hard-headed? Do you need to decide your course? Can you see what is happening beyond your personal perspective? Any-ho-ho here’s the bits from the reading and a few updates. They all interrelate, you know how I like to draw lines. First the Conscious Life Expo (post conference) with Hank Wesselman. As I read The Bowl of Light and get better acquainted with him and the story I am moved to comment and support his work and path. You can read the review here, at Lifencompass. I love this book. Yesterday was no exception to my enjoyment, or my exploration. Hank is lovingly multifaceted, humorous, intelligent, detailed, wise, and learned. I sat in the presence of an elder and I came away better for it. First for knowing that his work rings truth and second that he is, really, a walker between worlds. There was a distinctive twinkle in his eyes that communicated the light of what he represents and teaches. We’re lucky to have him, and people like him, in the world today. He sees into you, he looks at you from the heart. A Shaman. After the seminar, and some Journey Work to the drum: forgiveness. Healing. Compassion. My friend K and I took some time to catch up and talk about events in the world. Most specifically the recent changes and the quickened, or compact, nature of the latests shifts. (See end of last year through present). This flows with and through a pervasive sense of rising waters as the energy shifts in the subtle, that are chaning consciousness. It is as if the flavor of things have changed and we are all experiencing it. Some of us on a conscious level, others simply living through it. This week the catalyst has been sent to us. 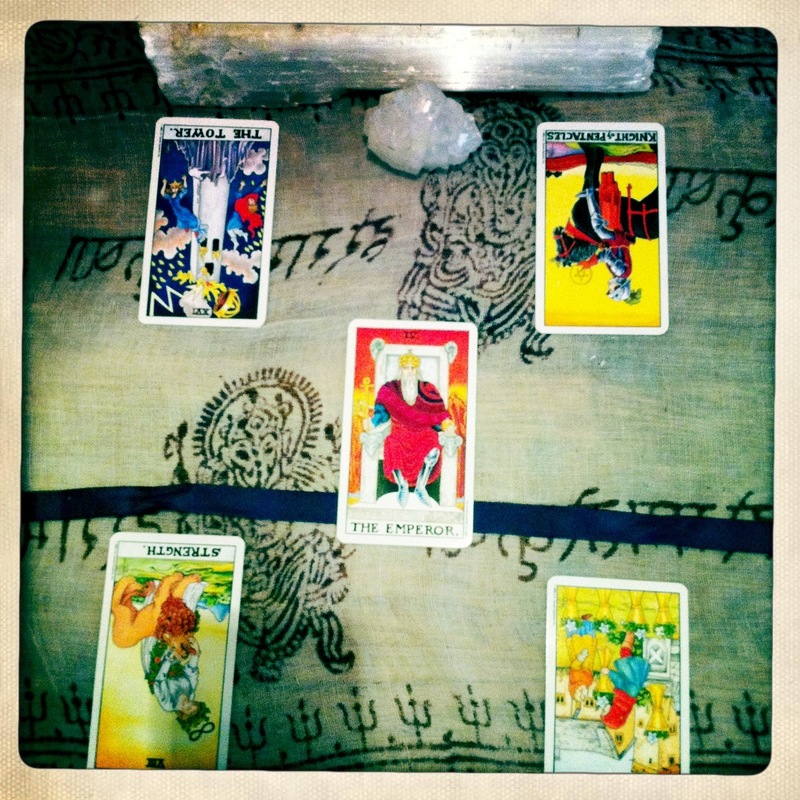 The cracks in the world of last weeks reading have been set to motion, as the Tower places center in our weekly spread. I would like to have this song playing but the music The House that Jack Built playing as you read the weekly, but I couldn’t find a quality version online. Of the house that Jack built. The call this week is for authenticity. To speak from the place of power that has been defined by ourself, within ourself, and in the world and relationships. Our dear Queen of Swords has appeared again in reverse. Though normally she is the direct speaker, often received as harsh, her words are now split or subtle. This tells me that our words can be misinterpreted or that observing the inner dialogue will reveal motivations or paths that can lead us to our goals without direct intervention or confrontation. The next two cards ask questions about our changes. What are you holding on? Why are you holding on to it? What are your choices? What feels right in the heart and makes sense? The heart is not the leader but one of our voices, the conversation must include the head for discernment and practicality. Meaning that you can spend a lot of time over analyzing but, hello *poke* this is the tower, it’s burning. Time to move folks. Change is upon you but the power to deflect what can feel like a strike at you is yours. Authenticity requires that we are absolutely truthful with ourself about ourself, our motives, wants, and needs. Act from a place of light and awareness. That very thing lessens any connection to human dramas that may evolve from this change. Be above it (spiritual) and within it (grounded and present), let your honesty shine. Change is now. It is irrevocable as a cycle completes a final turn and begins to close. The time for planning and negotiating, deciding direction and picking opportunities is past. The Tower burns, meaning that the structure is indeed hashed, the end is now. 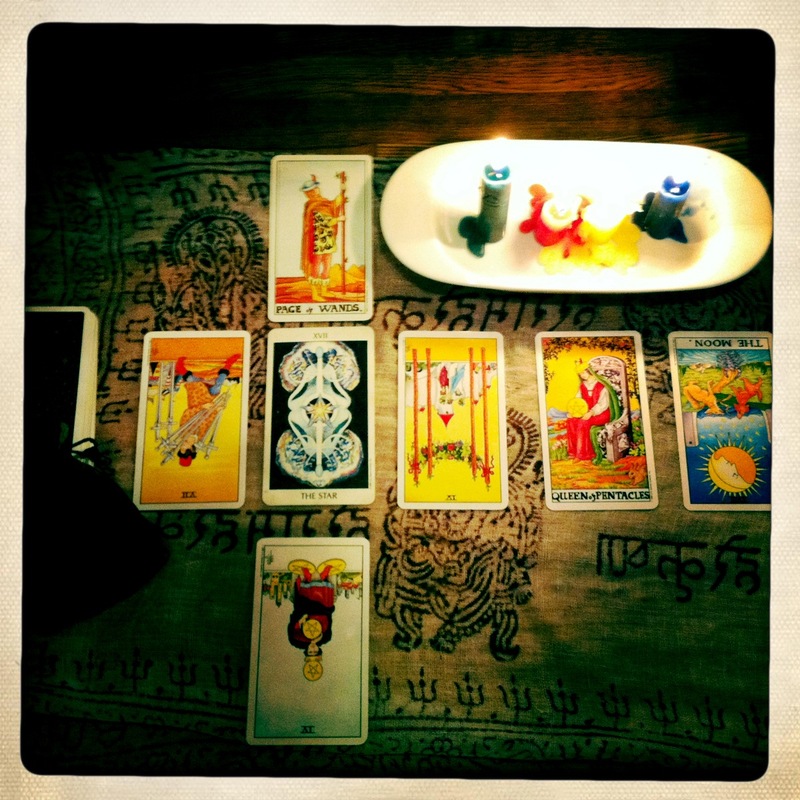 The Eight of Cups Reversed…. “The reversed Eight of Cups suggests that you may be feeling confused about where your best options lie. Part of you wants to explore new horizons and possibilities, but another part of you fears that in doing so, you’ll miss out on what your current circumstances have to offer. “In a reversed position, the Eight of Cups often indicates struggles concerning separation or moving on. There may be on over attachment to one’s past. In some cases, the Eight of Cups can indicate co-dependency or fear of being alone. There may be a reluctance to mature or grow up. 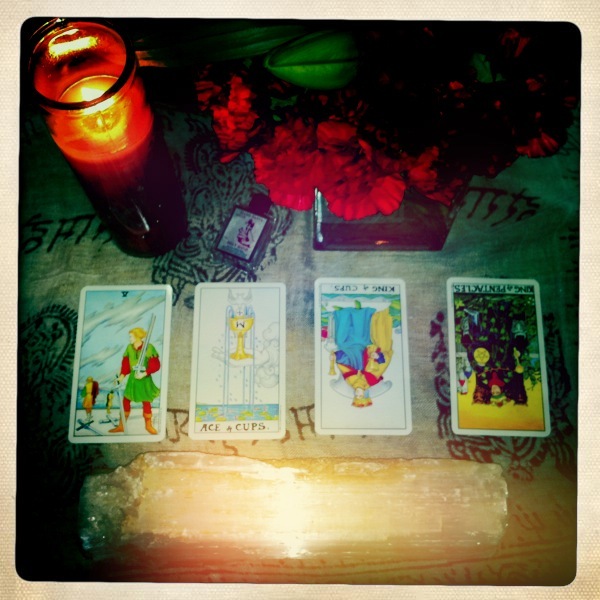 Although you may feel dissatisfied, your fears are preventing you from moving on.” ~Tarot Readings online. The fear there to be watched for is “giving up the dream,” because it could feel like you are walking away from your path. The reality is that only you can abandon that dream. Situations do not force you away from it, they only offer alternative directions is our intentions are set on the path and the goal. The path can hardly be called a straight line from point A to point B. There are twists and turns. I see that moment in the movie Labyrinth where a young Jennifer Connelly, as Sarah is entering the labyrinth. A little catarpillar tries to direct her through what appears to be a solid wall. No going forward, no way in, but it is an illusion. She passes through the the wall and see’s two new directions. My intuition points at this: quiet your tongue about your goal and ambition, much like spell-craft it can be knocked off course by psychic interfearence. (Often unitentional). Keep that to yourself or only with those who have your goal in mind and support it, unequivocally. The end of a period related to structures in your life has come. Do not fall into despair, walk hidden paths, seek the exit from the structure which is crumbling around you. This is a physical structure as in a job or home situation, things built on agreements with other people. Say goodbye to that House that Jack Built, use the challenges you have at the moment to strengthen your inner fire; and protect that flame, veil it. The support you may need can come from high and/or low. The presence of the White Phoenix lends aid from the upper realms as spiritual transformation, mirroring what happens at the soul level. As above so below. And below… Yes there is a pink stone, a rhodochrosite on a matrix of pyrite. This is both protection (pyrite) and energizing and related to the heart (rhodochrosite) helping to circulate the energy of love, compassion, alchemy, and transformation. Times can seem trying, tough, but if we keep faith in our abilities, self-determination, and instincts while lending trust to the forces that seek our betterment both physically and spiritually we can overcome anything and evolve into something greater. Know. Will. Dare. Keep silent. And give offerings of thanks for those that assist you. OK so this one is a bit punchy. I’ve had to start and stop a few times. I’ve spent the morning pulling cards, sipping java, shooing dogs and pouring over forecasts. I like to see the information I receive and find contrasts and comparisons in other channels. Tho I consider many sides I tend to follow the light of my own wisdom and pull in whatever seems to resonate with that message. My intention for each weekly has always been for spiritual growth, evolution even, of the reader with the context of issues and energies that arise. These are drawn from the Tarot. It has been noted, and this was truly appreciated, that certain cards can combine to mean certain things and I agree with this but as mentioned before, I’m pulling for a wide range: Others, healers, and those who are intending to lift the vibration of those around them. I believe in the principle of spiritual evolution, even if I don’t believe in aspects of many general theories about ascension, etc. Part of the reading is through my lense then and I see that as being a spiritual being, connected, living in the world, of the world (earth), and not waiting to exit it into a better “here after.” I’m concerned with the here and now and our affect in it, learning to grow as an individual and excel in doing better by assisting others. As you know I don’t always succeed, and so the Journey was born. In part The Journey is a journal, an honest log my experience, not as some authority but as a demonstration. This for me is living out loud for you to watch and maybe find connection to what comes through. Comparative experience. Being a Leo / Virgo cusp the detail oriented show off get’s a little rise out of that. ha. ha. ha. If you are interested in past Weekly’s, you can find them here at Lifencompass.com. There is an initial energy of detail orientation this week, starting with a need to explain or massage out your message. Follow it without letting it overrun your day. Pink is a strong color for Monday (see Laurie Cabot’s daily color pull on Twitter. Love it). The rest of it sort of stretches out for me in the following way. Speaking of which the Ace of Cups appears in our spread, card two, and I have a sense of the Bowl of Light or the Three Cauldrons pouring over rather gaily with the energies they carry. This may seem like a period of effervescence (had to spell check that one) but the uplifting feeling may need some grounding. Don’t worry the cards around the cauldron tho obstacles and potential be earthing forces. There may be a hack at the legs of your stability (recently) that has caused all your upward “hurrah” to come to a halt. That’s the grounding of the effervescence (above). Alternatively this could be a lost opportunity. You strove to make a goal and it doesn’t pan out. There could be a few things including (King of Cups) a lack of decisiveness, wallowing in emotional excess, or generally feeling or being made to feel uncertain about your situation, standing, and feelings. There is a double hitter here with another card (King of Pentacles) which feels for some like someone who was just restricting the hell out of you with an overbearing nature. Niggling issues of money, or bottom lines. They (the King of Pent type) might call it practicality, I call it bulling their opinion. Image of bull in the sitting room, woopse there goes the *China. * If this is an aspect of self it is focusing in on details of money, the method that progress or your movement is implemented. Remember that Saturn has gone Retrograde (no biggie in the bigger picture) so there are some restrictions that do apply to our growth and progress. Check to see if they are yours or reflections through others. These are court cards so… could be people but it could also be yourself. I want to put the two together and say stubborn emotional insistence. In the case of people be mindful that it may not be “negativity” it just may be that your paths are divergent. Mindfulness of what the message may be as paths cross could be illuminating. Note the meaning for yourself, take that minute to look at the broader picture, and go back to the beat of your own Aquarian drum. There is an energy in February that feels light. Yes it’s Imbolc, or Candelmas, and so it is a start in Light for us. We’re also approaching the Chinse Lunar New Year. Slow down and enjoy the uplift, it doesn’t last forever. Things happen that may set us back and we might have the tendency to vilify the people who are responsible for holding us back. In my opinion, that’s a waste of energy. Watch for emotional pits or wallowing (in any emotional state) that takes away from the here-and-now, stubbornness, insistence on your own way, or emotional weight gains that you may want to throw around, or that are being thrown at you. Enjoy a moment of light today or tomorrow. Fill your home with light. Light of friends and loved ones. Light of the Gods, stars, the Universe. And make a little celebration. Maybe even find a Chinese New Year party or Celebration on Thursday. Seeking balance or agreements that feel right for you in relationships. Finding, through the re-visioning or restructuring, a new sense of going ahead with your plans or relations that is not only better put together but also feels snug, correct in an emotional way. It’s as if we look back and see, “AH! That’s what was bugging me about this!” and so we change and it “fits.” Also keep in mind that Saturn is generally in retrograde 1/2 of a year, so look at it this sort of (seeming) backward moving period as part of life. It’s there 50% of the time and just par for the course, the cycle, and the season of living. I think this Saturn (R) should be interesting as well as the President delivers his State of the Union speech. As you know the President outlines his legislative agenda but we’ve had a few bucks to the system lately. There are a lot of talking heads yammering about right now about what the President should and should not do and say. I wonder if Barak Obama will find the words that “fit” the changes that must be made. Congress serves their constituents, the President serves the people. Let’s hope they work together. There is a pause before the change. There is a time of stillness before newness. A moment of darkness before birth. Like any good leader you have to garner the type of mind that knows when to act and when to remain still. Leading does not require constance manning the helm at all hours of the day, micro-managing is ANNOYING. It’s time for pow wow, not only a meeting but a gathering of strength and coming together to seek the answers that will best serve us as we come to a close on this last years big changes. Retrogrades and reverses, the World reversed for example, do not mean do not do, although they can I think they are generally there for evaluation. To curb our head strong beast and ask us to stop, look, listen. That the Star appears, and this is in conjunction with the Saturn+Libra, I think we’re finding the perfect time for inner landscaping seeking answers, solace, and even healing, or in my case easing the spiritual passage. I have the great fortune of knowing many readers, intuitive folk (and the like) and drawing on these friendly resources last week I found a common thread of answer for my own Journey. The message of the spiritual re-birth was clear and the pathway opened before me. From that path, and the reading, I would like to offer a few tips that may ease your passage in this period of observation, fine-tuning, and easing. Nurture your process with things of beauty, and acts of beauty. You may think of this as spiritually midwifing and seek out the healer within. Baths, massage, a special therapeutic ceremony that offers healing (The Star) can help you. Even energy work for the sake of something like love, joy, healing, or laughter, sensual giving… these are parts of the pattern of nurturing. Take advice. In the birthing passage it is hard to see anything else but the way out. It’s sometimes hard to feel anything but the birthing pain. These are leading you towards the new life but it is wise to seek outside perspective, especially when you are simultaneously the mother and the child. It can be confusing (I know) but a little common sense from the doctor can make a world of difference in your perspective. Expand your graces. Seek support from your spiritual allies who are probably very involved in your changes. Give offerings. I’ve decorated my house in sweet blossoms not only to bask in the fragrance but to symbolically represent the new birth and give up the blooms to the gods and guides who watch over me. I’m personally in the midst of this process but after I sought assistance and took the necessary steps to make right for my self and my transformation things began to right themselves. A little self-care can go a long way. I bit of insight can expand a limited insight. Though the King of Swords is here to call action and progress, I must remind each general that they need a bath, a brush, and a cup of tea with an advisor at the end of the day. No one is capable of doing it all themselves.